To educate parents and children about the opioid epidemic devastating communities across Columbia County, I will be hosting a drug forum on Tuesday, April 24, at Benton High School from 6-8 p.m. The event is intended for both children and adults and being led by medical professionals and local experts. The forum will provide information about drug abuse, the opioid crisis and ways to avoid drug addiction. Speakers will include Jeremy Reese, Columbia County coroner; representatives from Columbia-Montour-Snyder-Union Mental Health Service System; and a representative from a local rehabilitation facility. Informational flyers, pamphlets and other resources will be available. Passing the House this week was House Bill 2138, which would require the Department of Human Services (DHS) to institute work or community engagement requirements for able-bodied Medical Assistance recipients. The work requirements include being employed or attending a job training program for 20 or more hours a week or completing 12 job training program-related activities in a month. Exceptions do apply for those unable to work. More information is available at http://www.pahousegop.com/ctefocus.aspx. “The Wall That Heals,” a replica of the Vietnam Veterans Memorial in Washington, D.C., and an accompanying mobile Education Center, will be displayed on the State Capitol Grounds Wednesday, May 9, through Sunday, May 13. The display will begin with an opening ceremony at 7 p.m. on May 9, and closing at 2 p.m. on May 13. The display will be open 24 hours each day, and admission is free. Constructed of powder-coated aluminum, the wall features 24 individual panels bearing the names of more than 58,000 men and women who made the ultimate sacrifice in Vietnam. Since many Americans have not been able to visit the Vietnam Veterans Memorial in Washington, D.C., the Vietnam Veterans Memorial Fund (VVMF), creators of both the original wall and the replica, want to give all citizens, veterans and their family members an opportunity to see the memorial. Additional information about the mobile replica can be found at www.thewallthatheals.org. For more information about the Capitol event, or to volunteer to watch over the wall while it’s on the Capitol grounds, please visit www.legis.state.pa.us/TWTH. 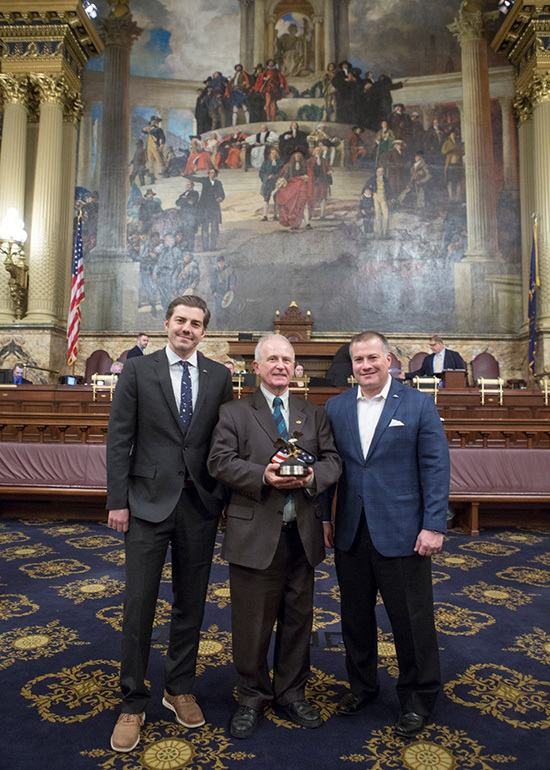 To encourage people to give the gift of life, House Resolution 821 was adopted by the House this week to declare April 2018 as Donate Life Month in Pennsylvania. In Pennsylvania, about 8,000 people are on the organ donation waiting list and, on average, every 18 hours one of them will die waiting for the call that never comes. The encouraging news is that more people are making the decision to “donate life.” About 4.7 million Pennsylvanians have said yes to organ and tissue donation by adding the donor designation on their driver’s license. More than 138 million Americans are registered donors. In addition, Pennsylvania driver’s license and ID card holders can support organ donation programs with a $1 donation at the time of application or renewal. To date, nearly $14 million has been generously donated to the fund. More information is available at www.donatelifepa.org. Congratulations to Drue Gerasimoff, a member of Boy Scout Troop 61, for becoming an Eagle Scout. Drue built a rock-climbing wall in the Main Township Park. 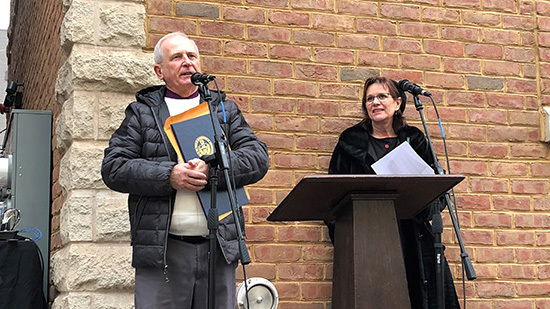 It was my pleasure to attend last weekend’s street party celebrating 40 years of the Bloomsburg Theater Ensemble. 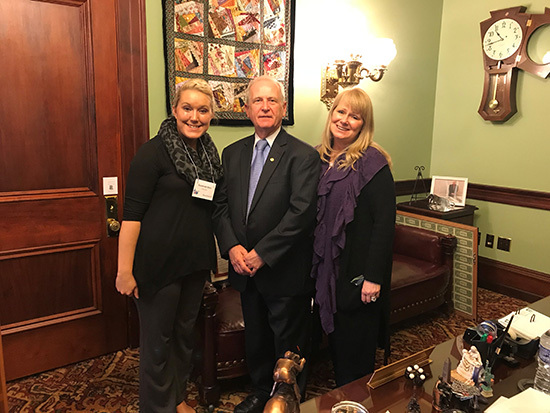 Pictured with me are Savannah Doss and Brenda Bennett from the American Cancer Society Action Network. Savannah and Brenda visited the Capitol this week. Pictured with me are Ben May and Nick Igdalsky from Pocono Raceway. In order to share resources with area caregivers, I am offering an Elder Caregiver Support Forum on Tuesday, April 24, from 10 a.m. to noon at the Northern Columbia Community Center, 42 Community Drive, Benton. Registration is required for this event. To register, call my office at 570-759-8734. The Pennsylvania Department of Transportation (PennDOT) recently announced that traffic deaths in Pennsylvania reached a new low in 2017, dropping to 1,137, the lowest since record keeping began in 1928, and 51 fewer than 2016. While the number of highway deaths dropped in many types of crashes, there were significant decreases were noted in impaired driver, pedestrian and unrestrained fatalities. Fatalities in impaired driver crashes dropped from 341 in 2016 to 246 in 2017. Unrestrained fatalities also decreased from 408 in 2016 to 378 last year. There were 150 pedestrian deaths in crashes in 2017 compared to 172 in 2016. Aside from the year-to-year decline, longer-term trends also continue to decrease. For example, compared to 2013, there were 71 fewer total traffic deaths, 203 fewer deaths in crashes involving impaired drivers, and 47 fewer unrestrained deaths. Some types of crashes saw fatality increases in 2017. There were 153 fatalities that occurred in crashes involving drivers aged 75 years or older, up from 132 in 2016. Also, fatalities in red-light running crashes increased to 35 from 28 in 2016. Finally, fatalities in work zone crashes increased from 16 to 19. The department also recently unveiled additional enhancements to its Pennsylvania Crash Information Tool (PCIT) website, www.dotcrashinfo.pa.gov, which uses reportable crash data from law enforcement to assist in reviewing this information. Users can now select a geographic location using a map by using a drawing feature that helps select a specific geographic area, like a public neighborhood, school or other geographic area, so that the map displays the reportable crashes for the selected location. In 2015, 27 percent of fatally injured motorcycle drivers were operating without a valid driver’s license. Additionally, three out of four motorcycle owners state that they have had at least one crash involving their bike, and 20 percent of owners who have been in a crash have had three or more during their lifetime. Forty-nine percent of motorcyclist deaths in 2015 occurred on weekends, and those deaths were more likely to occur after 6 p.m., compared with weekdays. The Pennsylvania Motorcycle Safety Program offers free training to all Pennsylvania residents and active duty military with a class motorcycle learner’s permit or motorcycle license. Training is offered for motorcycle drivers of all levels and includes: aspiring new riders, semi-experienced, three-wheeled and advanced riders. The Pennsylvania Motorcycle Safety Program offers classes throughout the entire year at multiple training sites throughout Pennsylvania. Class schedules are posted approximately four to six weeks in advance. 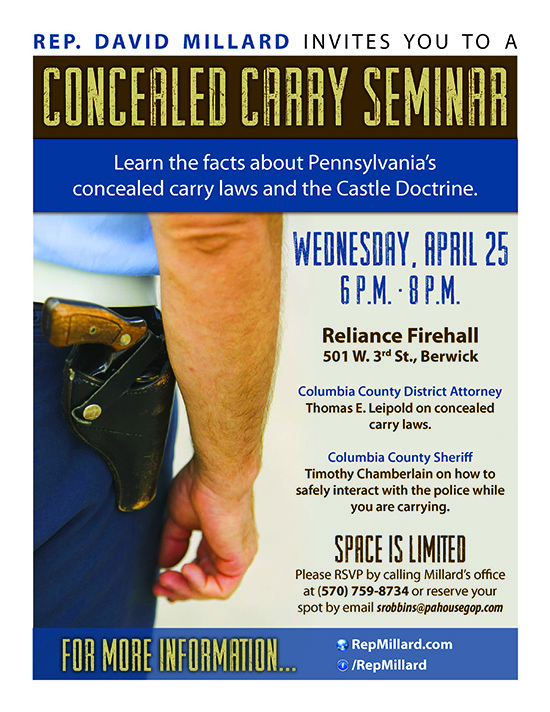 Join me for a Concealed Carry Seminar on Wednesday, April 25, at Reliance Fire Hall from 6-8 p.m. Columbia County District Attorney Thomas Leipold and Columbia County Sheriff Timothy Chamberlain will share information about Pennsylvania’s concealed carry laws, as well as how to safely interact with the police while carrying a firearm. Seating is limited and registration is required. Please RSVP by calling my office at 570-759-8734 or email srobbins@pahousegop.com. • Our fourth Spring Drug Forum will be held at Catawissa Fire Hall on Wednesday, May 9, at 6 p.m.